At the very last minute, I got to attend the Front Range Modern Quilt Guild's annual retreat. So a few March "finishes" didn't get into the parade on Saturday. I apologize to those quilters, and here are their wonderful quilts! 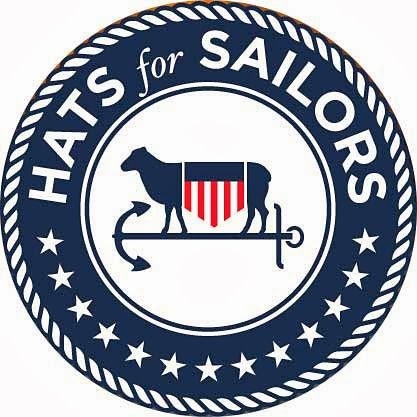 Debra reports, "While searching for some fabric I came across Windham Fabrics and they had a tab for Free Patterns. I browsed thru them and came across this pattern by Julie Hendricksen entitled "Miniatures". I loved it. I wanted to change it up a bit so I made my own design using Julie's pattern." 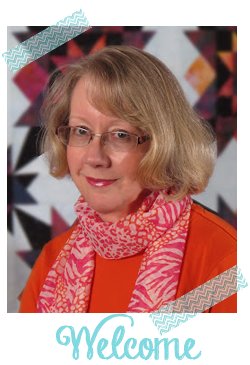 Debra B. has a gift for finishing complex, large quilts. I love this one specially, Deb (because it's pink!). 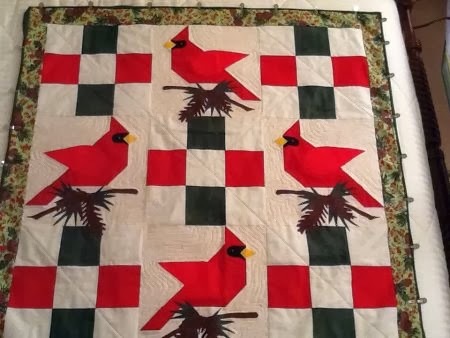 I feel bad that Joy in Nashville stayed up late to finish this quilt in time for the Parade, then I didn't get it posted! Isn't it lovely? "This is Winter's Story, a quilt I started for Christmas 2012, but didn't get it quilted before gift giving. I had the best intentions to get it done for 2013, but 2014 will do. 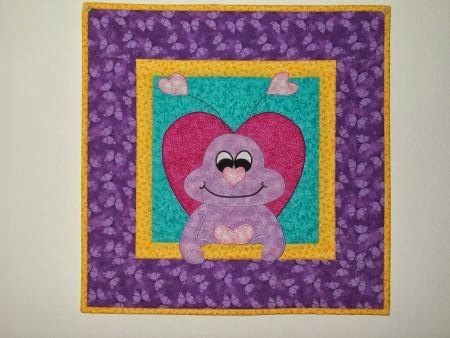 It is a combination of patchwork and appliqué. Thanks for the encouragement to get it finished"
Joy, I hope you'll submit another finish next month and I promise you'll lead the parade! 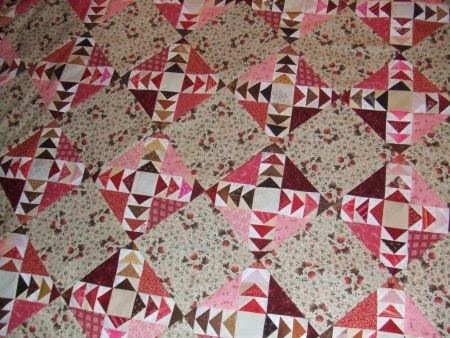 Becky has been practicing her free-motion quilting this month. And she has three finishes to share! First is this adorable wall hanging, called "Be My Valentine" from the free pattern section at www.thewhimsicalworkshop.com so Becky says "I HAD to finish him in February." Thank you all who submitted "finishes" for this month. I hope I haven't missed anyone, but if I have, please please shoot me an email with the photo of your own "finish" and I'll amend the addendum! 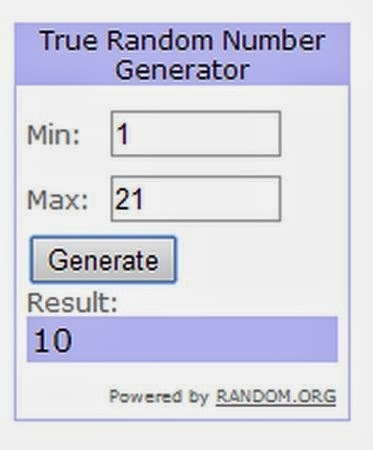 So many great quilts, I'll have to let the Random Number Generator choose a winner for this month's giveaway. I have a wonderful box of goodies from Quiltmaker Magazine's Scrap Squad to share! Oh, look, that's Donna for her "Cars" quilt. 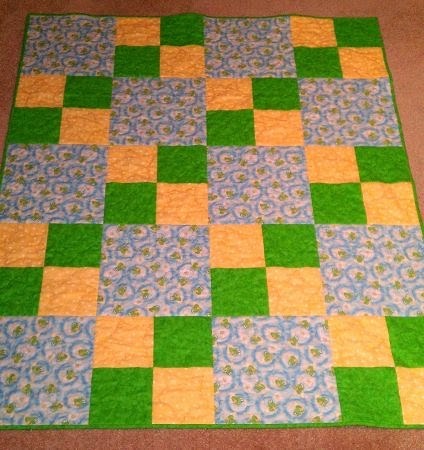 Donna, you'll have to tell your grandson his quilt is a winner! And please send me your postal address so I can send you something yummy! I have a very exciting announcement to make. Go here for a clue. And come back tomorrow to see what it is! Yay! I won something! And got a whole bunch of things finished at the same time! Now that is really 'Winning!'. And I already have a first finish for March. 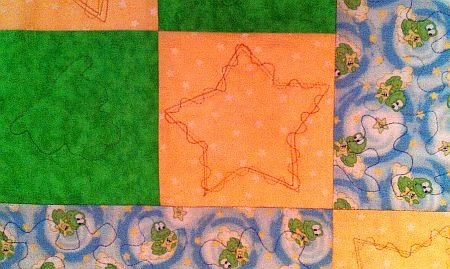 Finished a star baby quilt for a coworker who came back from materinity leave today. 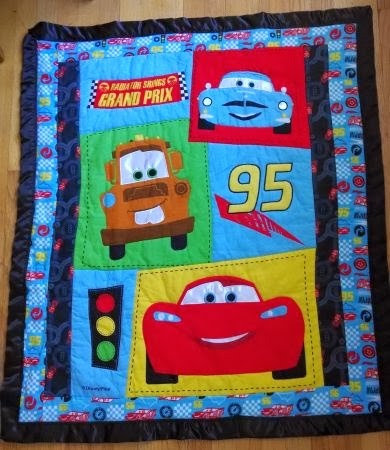 That Cars quilt IS a winner! So cute! Smashing show Marti, I always enjoy seeing the work of other ladies. I especially liked Joy's quilt, what a striking design. We don't have those birds here in England, our birds are much plainer and duller colours. I believe Joy's birds are called Red Cardinals? 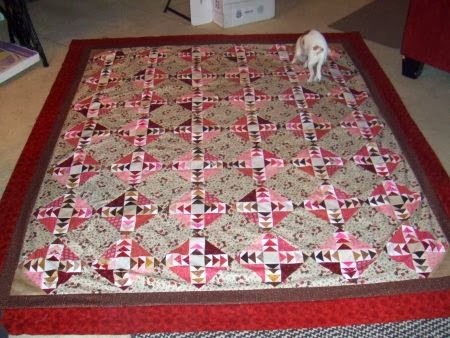 Pleased let her know that this quilter in England loves her quilt! Thank you for the compliment, Kath. You are correct, the birds are red cardinals. I love the vivid colors of these birds too. I mostly see them in winter when there is snow on the ground, so the color really pops.